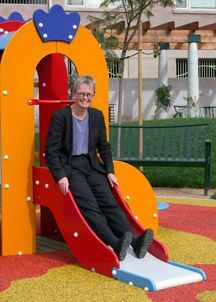 Patricia Smith, ASLA, AICP has more than 20 years experience providing urban design and landscape architecture services to private and public sector clients. She specializes in streetscape improvements. With ZGF, she prepared the Master Plan for Santa Monica Boulevard in West Hollywood which received a national AIA Urban Design Award in 2001, followed by the landscape design plans for the boulevard, including extensive median landscaping. Construction was completed in 2001. She designed and prepared construction documents for Phase 1 streetscape and landscape improvements in the Los Angeles Sports and Entertainment District around Staples Center and prepared the Streetscape Master Plan for future improvements. Pat prepared the Mission Street Specific Plan for the City of South Pasadena in 1995 and more recently prepared a Downtown Streetscape Plan and construction documents for the same area. She worked with the local community in the residential South Park community of Los Angeles to design Venice Hope Park, which includes an integrated public art component. She has prepared more than 20 landscape plans for elementary, middle and high schools, with an emphasis on replacing asphalt with play fields and planting area and providing shade through strategic tree planting. Click here to view Pat's resume.